Where do I even begin with this set? It’s amazing. Buy it. The end. Kidding….. Kind of. I suffer from really dry lips. REALLY dry. They constantly peel and never seem to stay hydrated feeling. I just recently found a lip balm that seems to last (see my review over eos), but still have dry lips if I don’t keep balm on them CONSTANTLY. So, every few days I use this mask. It really is amazing what it does to your lips. I first use warm water and wipe them clean with a wash cloth. Then leaving them slightly damp I apply the mask and let it sit for a full two minutes, sometimes longer if I get sidetracked doing something. 😉 Then, I get the washcloth wet with warm water and wipe all of the mask off. I kind of rub the areas that have the most dry skin a little harder to make sure I remove all of it. 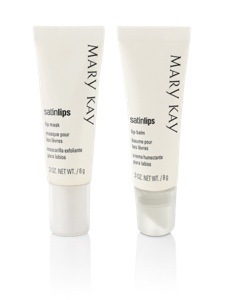 Then, apply the Satin Lips balm and enjoy how amazing my lips feel for several days! If you already have a Mary Kay Consultant get with her and get you some of this ASAP. 🙂 If you do not have one, I would love to be yours! I am signing up soon but already have a list of what I will be ordering for inventory, with a couple of these on there. If you want one let me know and I’ll make sure to have plenty on hand! That said, I want to let everyone know that I am becoming a consultant because I honestly love their products that I have tried thus far. There are several things I haven’t been able to try and I will not recommend or review something that I am not 100% passionate about and legitimately love. I will never try to sell you something that I do not swear by or use myself and I also will not “take” customers away from other consultants. I am still about sharing products I LOVE and it will stay that way. I will continue to review and try other products and will save my Mary Kay ramblings for Mondays! 🙂 Hope you are all just as excited about the Mary Kay products as I am!